Davis is one of the nation’s friendliest cities for bicycle commuters and is even home to the United States Bicycling Hall of Fame. Even so, accidents do happen. If you are injured in a bicycle accident, call the experienced bike accident attorneys at Adams & Corzine. Drivers in and around the area may be familiar with being on the road with bicyclists, but that does not mean that accidents never happen to cyclists in Davis. Between 2009 and 2012, an average of 64 bicycle accidents happened in Davis each year. If you are involved in a bicycle accident, the lawyers at the personal injury attorney firm of Adams & Corzine ready to support your claim for compensation. As a bicycle rider in Davis, you follow the same rules of the road as motor vehicles. You pay attention, follow local Davis and state bike laws, and do the best you can to protect yourself while cycling in and around Davis. Unfortunately, there are some drivers who simply act negligently, and negligent drivers are often the cause of bicycle accidents. 741 U.S. bicyclists were killed in bicycle-versus-vehicle accidents in 2013. You can learn more about these accidents and what you can do to protect yourself while riding a bicycle in Davis from the Insurance Institute for Highway Safety. Also know that experienced bicycle accident attorneys will act as your advocates if a negligent driver does injure you while you are cycling in Davis. Many Davis bicycle riders involved in accidents suffer from severe head trauma. A bicycle rider may not have a visible head injury, but may still suffer from a traumatic brain injury (TBI), also known as a closed-head injury. These types of injuries are sustained when the brain experiences a jarring impact. Cyclists in Davis with these types of injuries can suffer from confusion, dizziness, headaches, difficulty completing tasks, nausea, fatigue, and changes in personality or energy level. Why Choose Adams & Corzine as your Bicycle Accident Attorney? At Adams & Corzine, we are experienced, passionate personal injury and bicycle accident lawyers. We have worked closely with cycling accident victims and their families in Davis and the surrounding areas to achieve justice after an injury or death. We understand the details of state and local Davis bicycle laws and will advocate for you in both negotiation rooms and courtrooms. We know that riding a bicycle offers a great way to commute in Davis, exercise and spend time outdoors. We also know that there are dangers inherent in this popular pastime. Our bicycle accident attorneys are dedicated to understanding what happened during your accident in Davis and providing you with the very best legal representation possible. If you or a loved one has been injured or killed in a bicycle-versus-vehicle accident in Davis, please call the attorneys at Adams & Corzine today so we can set up a free consultation to talk about your case. There are time limits when it come to asking for compensation after an accident, so it is essential to act quickly. We work on a contingency fee basis, which means that we only get paid if we are able to recover compensation for you. Please do not hesitate to call us if you need help following a Davis cycling accident. 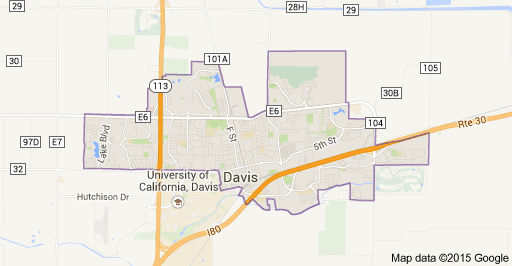 Many people know Davis, CA for it’s fantastic college. Davis is a very liberal city and has many bicycle paths for the myriad of bike riders. It is also in part because of UC Davis’ strong presence throughout the city. Originally founded around a railroad depot build in 1868, Davis was originally known as Davisville. The US Postal service shortened it to simply, “Davis” and it was adopted officially when the city was incorporated in 1917. With Davis attracting a very large young crowd, you can bet there are loads of fun events and activities going on throughout the year. From regular farmer’s markets to seeing a show at the Mondavi Center, Davis has the entertainment you’re looking for with the small town feel you won’t forget.